Buying a new computer for your business can be quite confusing if you don’t know what to look for. You will be thrown a lot of choices such as hard drives, memory, processor, gigabytes, megabytes etc. But if you are not technical, how do you decide? This article will help guide you through that. There are several key aspects in choosing the right computer that suits your needs. But the first decision is whether you want a cheap disposable computer, or a long lasting business machine. They both have a place and the difference there obviously is quality and price. The most frequently asked question is, what is the difference in a “disposable” or “off the shelf” (assembly line) computer and a high quality computer. The short answer is, you always get what you pay for! Generally speaking a custom built PC is always a better choice for a number of reasons. You will get exactly what you want without the bloatware (preloaded, games, trial software etc), it is much more powerful and very upgradeable. If you want a machine that is very reliable and will last for many years, a custom built machine is the way to go. NTI provides very high quality workstations, so if you are looking for a multiple screen computer system, that is our specialty. Contact us today and ask about our QuadStation Systems. We love nothing more than doing a side by side component comparison of one of our machines against any other on the market. If you are technical these decisions will be easy. But to the general consumer they may not know the difference between types of memory or the difference between a Dual Core and a Quad Core processor. This is where asking questions helps. ​​Feel free to contact NTI to ask your questions. Whether you decide to buy from us or not, we will give you straight and honest advice. Our phone number is at the top of this page. First, you will need to have an idea of the processor speed you want. Choose a processor based on your current needs but allow for the future. The overall speed of any computer starts with the processor. In this article we will refer only Intel processors because they are the fastest available. We recommend buying a little more speed than you need. Why? So your computer does not become obsolete too soon. The Processor is the primary component of speed in your PC. This is the speed at which your computer “processes” numbers (which is all it does really…0’s and 1’s) There are a handful of PC Processor companies, but Intel is the driving force. Far and away the leader in the industry and NTI’s preferred processor. Processors are defined by classes such as i-3, i-5, i7, i-9 etc. The i7 and i-9 class of processors are the top of the line. If you do not need quite as much speed drop down to an i-5 but no lower. Processor clock speeds are measure in Ghz, an Intel 3.5Ghz processor for example . But, it is not just about the Ghz number, it is more about the CORES now. In the past, measuring processor speed was all about the Ghz. That measurement has become less important as the microarchitecture of processors has changed. CPU speed is measured now more by how many CORES are on the chip and not so much about the clock speed of one core. More cores = more speed, it is that simple. 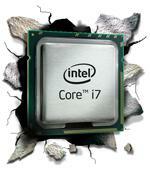 Intel’s fast i7 processors combined with HyperThreading technology DOUBLES the virtual processing threads. Each ‘thread’ equates to a separate lane of data traffic. More lanes of traffic means more information can be processed simultaneously. Your experience will be an increase in overall speed. The motherboard is the main circuit board in your system and it is vital that it cooperates in perfect harmony with all other components used in the system. You want to use a high quality motherboard as well as an Intel processor with high quality memory (NTI’s standard in all of our systems since 1995). If you are buying a system from a retail chain you will rarely if ever have a choice in the manufacturer of the motherboard so no point in really asking. And don’t be fooled by advertisements touting “Intel Inside”. Although it may be true that there is an Intel processor inside the machine, what you are NOT told is that it could be sitting on a cheap or generic motherboard! All the major box makers will normally use whichever motherboard is cheapest at that time. The video card provides the ‘display signal’ to your monitors. If you have an off the shelf type PC like a Dell or other, you may have a video card built onto the motherboard. The video card you need depends on what you are using your computer for. If you are purchasing a system from NTI it is more than likely a multi monitor display system which will come with a separate, high quality video card. If you are a CAD designer or require 3D graphics, you will need a higher end video card. If the purpose of your system is solely for business use, or a stock trading computer, for example, workstation grade video cards will do the job. Your hard drive is your storage capacity. The type of hard drive used will make a difference in the speed in which you can access your data. This is the place where all of your programs and data are stored. It is a good idea to get a fast solid state hard drive vs a regular SATA type drive. A standard sized SSD drive use usually good enough to run all of your software programs and Windows operating system. The size of the drive depends on how much data you have. A 240-500G main drive is enough space for the majority of users. If you have a lot of data to store, you may need a separate large capacity drive. The amount of memory in your machine is another contributing factor in how fast things will run when you have several programs open at once. Get a system with at least 16G of fast, high quality memory such as Kingston. Memory speeds up the way the computer interacts between programs when working in Windows. The standard CD-ROM drive has gone by the wayside for the most part as most new system come standard with a DVDRW (burner) drive which is backwards compatible back to the CD rom and everything inbetween. All desktop computers usually come with DVDRW drive so nothing to worry about there. Note that USB storage devices have taken the place of burning things to disks. Copying anything to a USB thumb drive is much faster and easier. There are many monitor brands on the market such as ASUS, ViewSonic, and Samsung to name a few. The old standard CRT displays are now obsolete and replaced with more streamlined and sleek LED Flat Panels. Although monitor size does matter, there are other factors to consider with respect to monitor details. Resolution, screen size, contrast ration, aspect ratio, and brightness are the things you will be comparing when shopping for a new LCD. Keep in mind it is easy to overthink the details particularly with LEDs. Click here for How to Buy Monitors. Most are good enough for general use but if you have a profession that requires you to stare and a screen all day, pay the extra money and get good quality monitors. If you are planning on using more than one monitor which is more common these days, you will need a multiple monitor mount. Click here for full details on that topic. This is a very common dilemma. The decision really comes down your personal needs. Would you like or do you have the need for the portability of a laptop? When traveling, do you want to take your information with you or need to check your email when you are away? If you have 2 homes and would prefer to transport a lightweight laptop rather than your much heavier desktop, then maybe that is the way to go. If you don’t have the need for portability, then a desktop will give you a lot more power and far more upgradeable. If you are a business user and you travel frequently, a laptop is probably a better choice. See our 3 Display Laptop System here. When shopping for a laptop don’t be fooled by the $799 deals out there. The old cliche holds true, “you get what you pay for”. A notebook in this price range will probably have a much lower class processor such as an AMD or even Celeron, and generic motherboard. If you are going to invest in a notebook, buy high quality. Notebooks are not as easy to upgrade as desktops so get the best one you can afford. You will always get more power and the flexibility of upgrading with a desktop. Laptops will always be somewhat limited in that regard. So if you need flat out performance, upgradeability, speed and more than 2 displays. A desktop is a better choice for you. Desktops usually last twice as long as laptops as well, something else to consider. There is nothing worse than fighting a mouse cursor of a cheap mouse. An optical mouse is most common these days and much more accurate than the older ball style mice. For graphic design or photo editing the optical is a must as it will allow you to move in much more precise increments. Hard wired USB or Wireless? that is up to you. If you are using your computer in a mission critical environment or anything to do with money, use a hard wired keyboard and mouse. A stock trader for example. The last thing you want is the batteries to go dead when you are trying to get out of a stock trade. You want to make sure your new desktop computer has at lease 4 or more USB ports. There are different types of computer USB ports USB 2.0, 3.0, 3.1 etc. The higher the number the faster the throughput but your device has to support that speed. Most USB ports are backwards compatible. This means that if you have a USB 2.0 device you can still plug that into a USB 3.0 device. The quality of the component should be directly proportionate to your personal use. If you prefer higher quality audio, spend a few extra bucks on a better sound card. Otherwise a basic sound card will be just fine. No matter what, get the highest quality components , you will never regret it. Buy more than you need right now because you will grow into it later and the technology in your system will last much longer. For the highest quality computer systems available worldwide, look at NTI’s QuadStation multiple screen computers. If you appreciate quality, there is nothing better. If you have any questions found in this article feel free to call us now!